Does anyone else love butternut squash as much as I do? There are a so many ways to cook and enjoy this wonderful fall fruit! Yeah that’s right people, it’s a fruit! Don’t worry, I spent years thinking I was eating a vegetable too….. In this recipe the suttle hints of cumin and paprika create a smoky depth of flavor. By roasting at a high temperature, they get crisp on the outside and nice and tender on the inside. These will make a nice addition to my Thanksgiving menu this year! 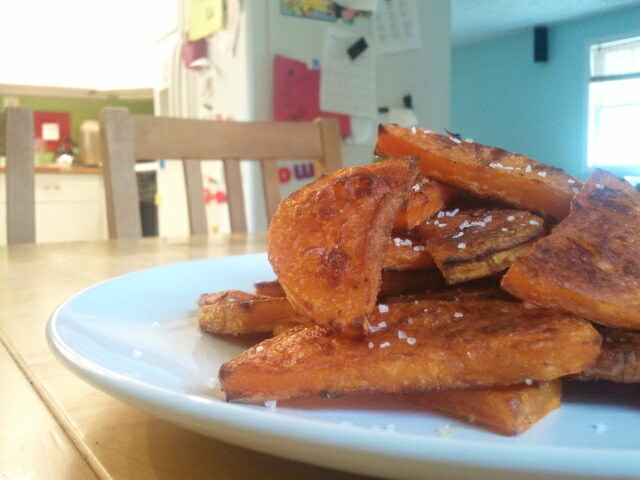 So here is my version of GF Roasted Butternut Squash. Garlic – I think the more the merrier! Cut squash into 1/2 in slices. Spread on sheet tray, making sure each piece lay flat. Sprinkle on a bit of each spice, but not too much, you do not want to overwhelm the delicate squash flavor. Roast for about 25-30 minutes, turning over halfway thru baking. Sprinkle with sea salt after baking and serve! * the same cooking method could be used to create a sweeter version - sprinkle with cinnamon and drizzle with honey. These are delicious!!!!! And also liked the cheddar sage biscuits though I didn’t have sage and used chives instead. Yum! I made these, sprinkled with ginger and cinnamon. Totally awesome! My husband actually put ketchup on his, so I think that next time, I’ll cut them into strips and try them that way..
Definitely crispy on the outside and smooth inside. THANK YOU!